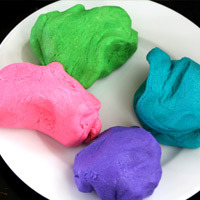 Making your own playdough is easy. Flour, water, salt and food coloring is all it takes. The salt preserves it, so it will stay good in air tight container up to one month. Add all ingredients to the bowl of an electric mixer. 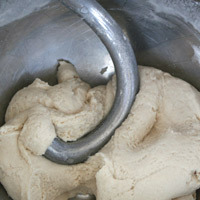 Knead with the dough hook until it comes together, 1-2 minutes. Add more flour or water as needed. Divide into four equal pieces. Add food coloring and knead by hand until incorporated. It's ready to use! Store in an airtight container up to one month. The food coloring mixes in faster by hand than it does by machine. Add all ingredients to the bowl of an electric mixer. 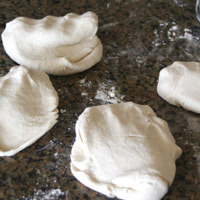 Knead with the dough hook until it comes together, 1-2 minutes. 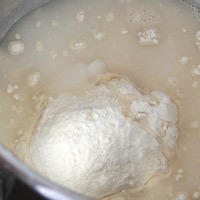 Add more flour or water as needed. Divide into four equal pieces. 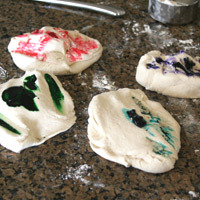 Add food coloring and knead by (1)hand until incorporated. It's ready to use! Store in an airtight container up to one month. 1. The food coloring mixes in faster by hand than it does by machine.